The Jaguar XJR was released in 2003 as part of the latest XJ range. The XJ was the first series-production car to be made, almost completely, from aluminium. This made it 200kg lighter than its predecessor despite it being longer, wider and taller than the previous car and having better leg and head room for all four passengers. Its aluminium body also makes it 10-15% more rigid than the previous Jaguar which improves its driveability and its strength. The 'aluminium XJ' was the seventh generation of Jaguar to carry the XJ badge, the first having been unveiled in 1968. XJs were powered either by a tried and tested 4.2 litre V8 engine, or new 3.5 litre V8 and 3.0 litre V6 options. All models came with a six speed automatic gear box. 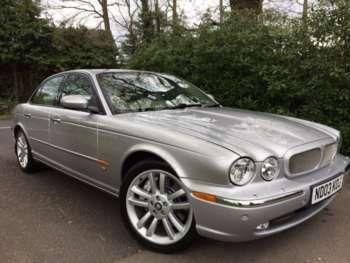 Soon after, the initial launch, Jaguar introduced long wheel-based versions which were supplemented with the addition of the luxury Sovereign trim level and an XJ6 entry-level car. A diesel option was added in the spring of 2005 and in 2007 the XJ underwent a cosmetic upgrade which gave it a much more sporty look. However, the new large bumper and side gills weren't too popular with some Jag enthusiasts. The usd Jaguar XJR was fitted with a supercharged version of the 4.2 litre V8 engine which generated a mighty 400 bhp. The Jaguar XJR is an understated work of genius. It still has the classic Jaguar looks and the interior is as classy and well put together as you would expect. But its innovative aluminium body improves its fuel economy, performance, rust resistance and carbon emissions rating. All this and the used Jaguar XJR is bigger than its predecessor both in terms of leg and head room and luggage space. All XJ models were fitted with the innovative self-levelling air suspension system in combination with the CATS (Computer Active Technology Suspension) system. This was a first for Jaguar and means that the full suspension travel is available at all times through increasing spring stiffness relative to the car's weight. The result is that the XJR never slumps when travelling with a heavy payload and offers increased comfort and refinement. Additionally, aerodynamic efficiency can also be improved when travelling at speed by the automatic lowering of the ride height. Used XJs hold their value pretty well, probably even better than their Mercedes and BMW equivalents. Jaguar XJR cars for sale are available for around £40000. Other 4.2 litre models kick off at around £35,000 for the SE or Sport and a 52 plate Super V8 will still relieve you of £45,000. Prices for the 3.0 litre XJ start at around £27750 for the base trim and you can add another £2000 for the SE or Sport versions. The 3.5 litre V8 version is very sought after and will set you back around £32800 for a 52 plate. Buying a used Jaguar XJR used to be for the brave or foolhardy only, but since they were taken over by Ford, the majority of their previous reliability issues have been smoothed out and Jaguars can now compete with both Mercedes and BMW in the reliability stakes. There are no known mechanical issues with the XJR, the only known problem has been with the in-car entertainment system but even this is rare. Replacement parts aren't cheap for second hand Jaguar XJR cars but then, you probably won't need to buy many. To give you a few examples, a replacement starter motor is around £375 and a radiator costs approximately £425. Front brake pads are around £75 per set and rears are around £60. The 4.2 litre supercharged V8 engine supplied with the Jaguar XJR is the pick of the bunch in this XJ range. It is also fitted in the Super V8 model and will generate 400 bhp. 4.2 litre cars such as the XJR are the only ones available in long-wheelbase form. All of this power combined with the XJR's lightweight frame results in an astonishing performance. The non-supercharged engine will produce 300 bhp. A 3.5 litre V8 is also available and will generate 262 bhp. If you can afford the fairly high asking price for a used XJR, you could do a lot worse than invest in one. They are reliable, stylish and good to drive and are just as good and in many ways superior to, their German equivalents.